Ah… the 1970’s. What a glorious time! I’m sure everyone will agree with me that bell bottoms are the most iconic style from the 1970’s. I am usually more of mid-century style gal, but there’s something about bell bottoms that makes my heart sing and my hips shake to the soundtrack of Saturday Night Fever. 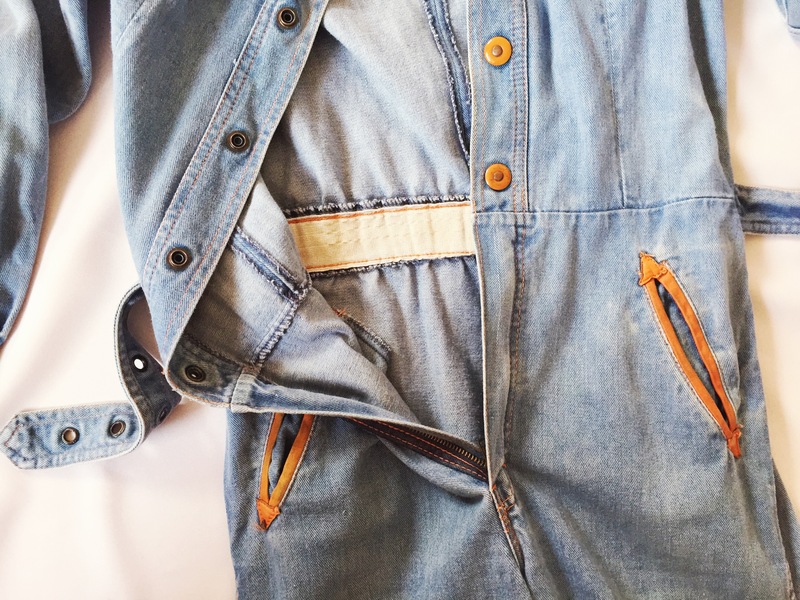 When I found this denim jumpsuit in a Buffalo Exchange in Colorado earlier this year, it was love at first sight. 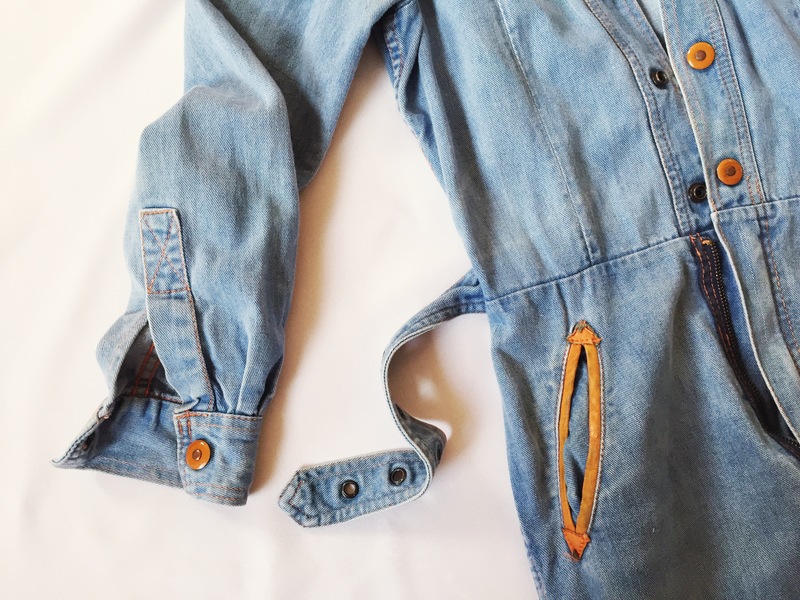 I have been searching for a vintage (denim) jumpsuit for as long as I can remember, and to find a vintage one in a resale shop is just like a dream come true! Of course, the fact that it fits me is the icing on the cake. For me, the bell bottoms and label are dead giveaways for the age of this jumpsuit. I have thrifted a couple of items by Faded Glory previously and I immediately recognised that this ornate design appears to be an older version of the one they have in other items I have, like this straw bag I used to own (pictured below). Usually, I would consult the label resource on Vintage Fashion Guild to confirm my suspicion. Unfortunately, there’s no entry on Faded Glory on the site currently. A straw bag by Faded Glory with a different label design. I thrifted this a few years ago in Texas. What I usually do next is a bit of detective work – I would look up other items with the same label that are listed on online sites such as eBay and Etsy. True enough, many people have also described this label as something from the 1970’s. In addition to the design of the company label, the “Made in Hong Kong” label provides another detail that supports my guess. Most high-street items these days are made in China and other developing countries such as Vietnam and Bangladesh (where labour is cheap, sadly). When industralisation started gaining speed in the 1970s, many factories that produced clothes were located in countries like Hong Kong and Taiwan. Some quality vintage items from the 1950’s and 1960’s may even be labelled as “Made in British Crown Colony of Hong Kong”. Do you like the fashion from the 1970’s? What’s your favourite part of the 1970’s? What happens when a girl loves straw bags, has a huge stash of yarn, and is developing an obsession with pom poms? I have always had a soft spot for cute summer bags. Be it vintage wicker bags, straw bags, weaved basket bags, bamboo bags… whatever you like to call them, anything that goes under one of the aforementioned categories of bag make me go weak on my knees. While I appreciate the beauty and versatility of a plain straw bag, I also enjoy changing styles and adding pops of colour to my looks. Adding pom poms in coordinating colours to my beloved second-hand weaved straw bag seems to be the natural thing to do! 1. Make 3 or more pom poms in different sizes using a pom pom maker. Ensure that you leave a long tail for each pom pom. This is important for adjusting the length of the pom pom charm later. 2. Hold the cluster of pom poms together and place it against your straw bag. 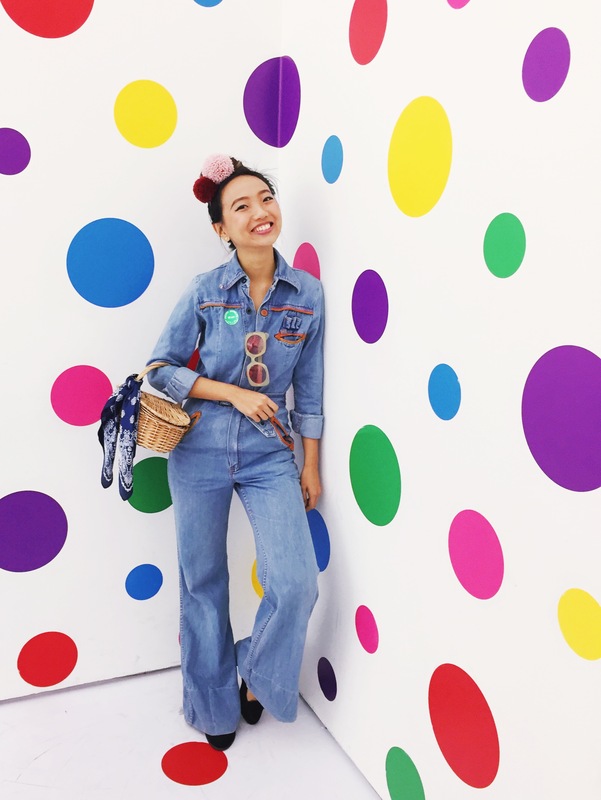 Adjust the length of each tail of each pom pom for your desired look. For example, I made sure that the brown pom pom is the longest of all 3 pom poms, while the other 2 pink pom poms are about the same height. Trim the tail according to the desired final length of the pom pom charm. 3. Using your jewellery pliers, secure the end of all the tails of the pom poms with the folding crimp. Add the jump ring and lobster clasp to the folding crimp. 4. Wrap the tail around the handle of the straw bag and hook the lobster clasp around the strands of yarn. Voila! You now have a pom pom charm hanging on your straw bag! In hindsight, it might have been better to use a different shade of brown as the brown I picked looks too much like the colour of the bag itself. But I guess having a low-key look with the cluster of pom poms isn’t too bad either. Try making one yourself if you have some time (and yarn) to spare this weekend! I’d love to see your versions!